We arrived at Papeete airport very late on the evening of the 27th and next day hired a car to drive around. 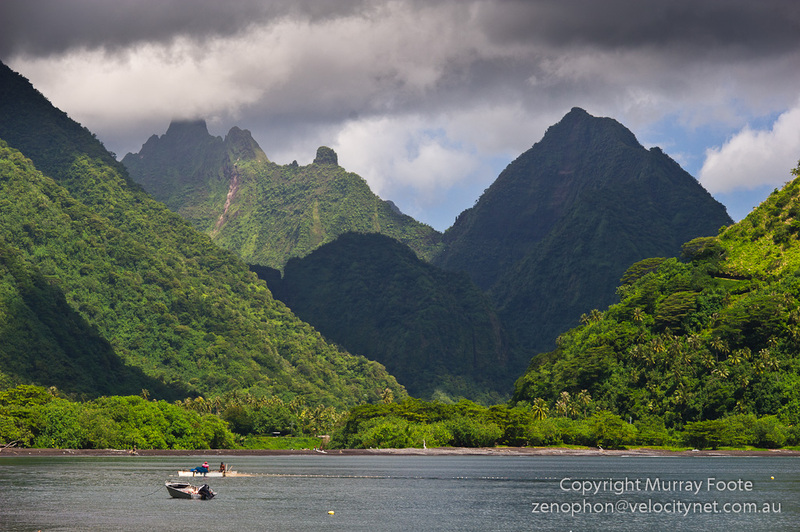 Tahiti is the largest island in the Society Islands and comprises two volcanic cones joined together, the larger Tahiti Niu and the smaller Tahiti Iti. We were staying quite close to an important museum which we didn’t actually visit because were short of time and preferred to see what we could. The rental company didn’t open until 10, we had to wait in a queue and then drive back to get our gear so quite a lot of the morning was gone before we got going. Then we drove without stopping to the end of the road on the South-East of the Island at Tautira. Robert Louis Stevenson stayed here for two months in 1888 and described it as “the most beautiful spot, and its people the most amiable I ever have found”. There was a tiki or stone statue beside the beach. I understand that this would have had an ancient function for ancestor worship, somewhat like the moai on Easter Island. While we were there, a fishing operation was underway, with a net being drawn in a semicircle and slowly closed. The colonial history of Tahiti was really quite savage. The first European visitor was Wallis in 1767 followed by de Bougainville in 1768 and Cook in 1769, 1773, 1774 and 1777. Some of the mutineers from the Bounty stayed there from 1789 to 1791 and destabilised the political situation by making themselves and their firearms available to war parties of particular tribes. Meanwhile, due mainly to disease, the population fell catastrophically from about 150,000 in 1767 to 16,000 in 1797 and to a low of around 7,000 by 1865. De Bougainville had reported back on the idyllic life of the Tahitians, providing support for the Rousseauian concept of the “noble savage”. From 1815 British missionaries tried to put paid to all that, depriving Tahitians of their traditional pleasures and undermining their culture, even prohibiting the wearing of flowers in the hair. French missionaries who arrived some years later appear to have been even worse and Queen Pomare Vahine IV initially succeeded in expelling them. Through a mixture of trickery and military force, the French took over Tahiti in the early 1840s and nearly provoked a war with Britain. The Tahitians appealed to Britain to take over instead of the French and waged a war of resistance for three years but eventually had to concede. They held out for some time in Tahiti Iti but the French blockaded them in by barricading the isthmus. In 1880, Tahiti became a French colony rather than a protectorate and was administered directly rather than indirectly through local chiefs, as with British Pacific colonies. The local Polynesian population had little or no political influence. The population now numbers around 170,000, of whom 80% are Polynesians. From the 1960s there have been various campaigns for independence, associated until the mid-1990s with campaigns against nuclear testing. The current President of French Polynesia, Oscar Temaru, born in Tahiti, leads a pro-independence party but his coalition partners do not support him in this. 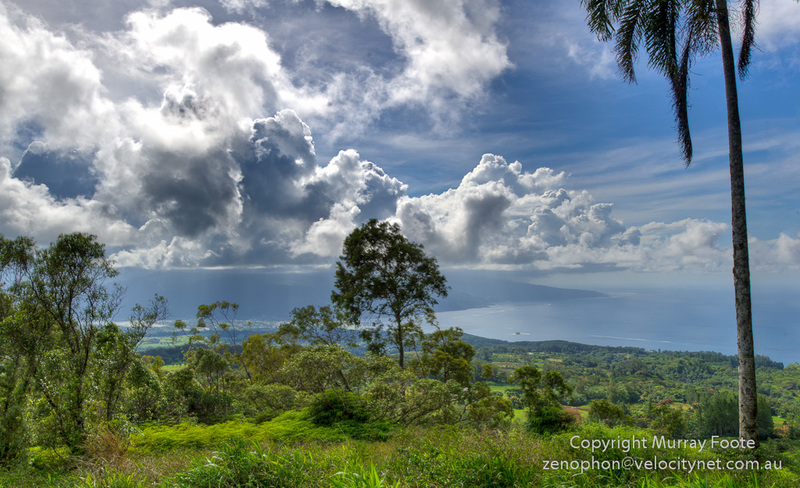 Here, from the Vaiufaufa viewpoint on Tahiti Iti, you can see the isthmus and Tahiti Nui behind that. 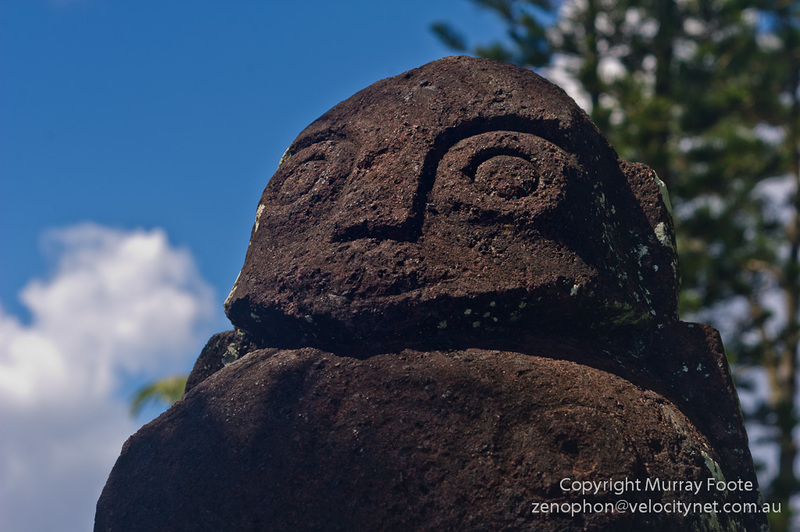 In the 1840s, Tahitian warriors may have looked out from here contemplating how to drive the French from their land. Also, here’s another link from the blog of my friend David Hooper in a remote corner of Ethiopia: The Mursi – stretched lips and AK47s. This entry was posted in 1st Page for Tahiti, Home, Tahiti and tagged History, Photography, Tahiti, Tahiti Iti, Tautira, Travel. I haven’t tried the RSS feeds. Is it that they don’t work or is it just that I wasn’t posting for a few months but I am now again now that I am travelling in Japan. No time to respond to comments probably for quite some time.